After 57 days of being lost in South St Louis, Sophie is home! It all began on October 1st, 2014. 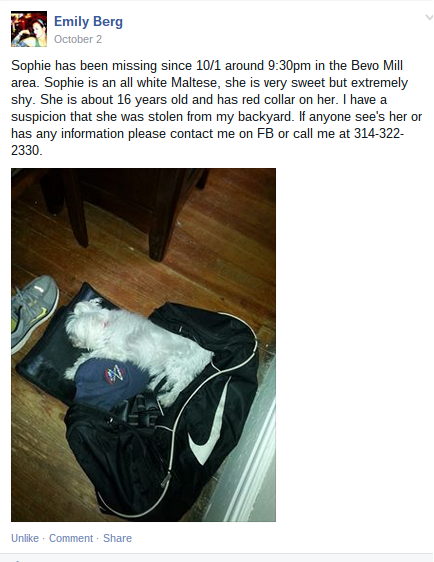 Sophie, an all white 16 year old Maltese dog, vanished from her fenced in backyard. Her owner, Emily, was puzzled. Sophie had never gotten out of the yard before. Sophie had never come up missing before. Sophie was quite a well behaved little girl who was used to going out to potty in her yard and coming back to the door to be let in. But for some reason, on October 1st, things were different. Emily let Sophie out to potty as she would any other time. Emily went to let Sophie back in minutes later (how many minutes would you say it had been?). Sophie was no where to be found. Emily called for Sophie, thinking maybe she’s sniffing around. After all, she is a senior doggie. Nothing. Sophie did not return to the door. Emily walked around the yard looking, and looking. No signs of Sophie. Emily began walking the neighborhood to look for Sophie. As the minutes passed, the anxiety arose. 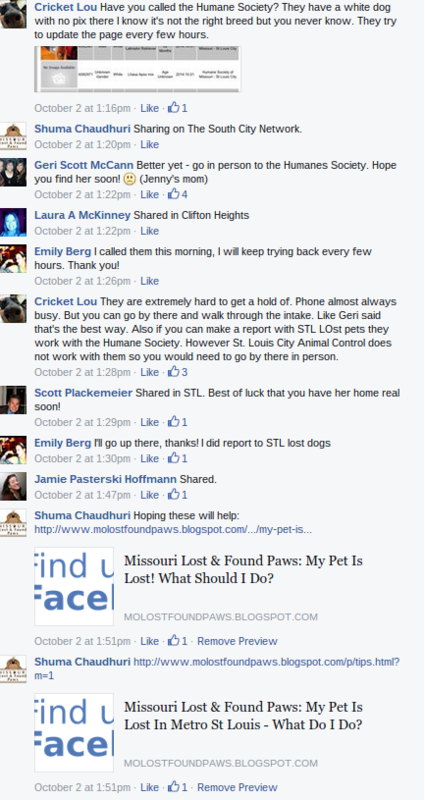 On October 2nd, Emily made the following post on St Louis, Missouri Lost & Found Paws. She submitting her post at 12:50 pm. Starting at 1:16 pm, supporters of Missouri Lost & Found Paws for the St Louis region began offering tips and encouragement for Emily and her search of Sophie. Emily stayed engaged in the conversation, and responded to supporters and their inquiries. 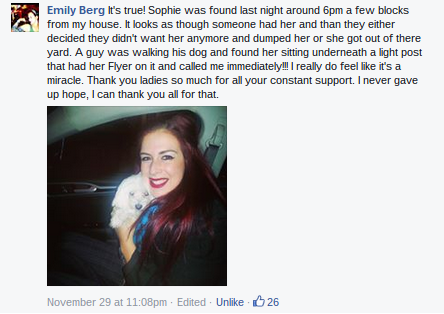 Emily shared her thoughts on Sophie’s disappearance. 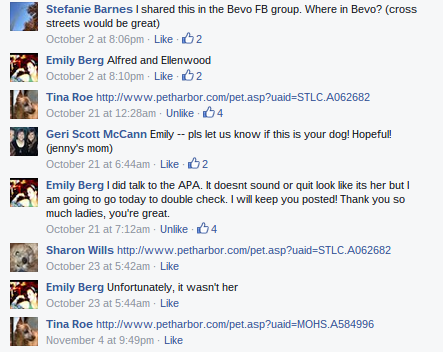 The admins for the St Louis, Missouri Lost & Found Paws group posted Sophie to our Lost Dogs album later on the evening of October 2nd. As days went by, Emily continued hanging flyers in a broadened area of where Sophie went missing from her backyard. 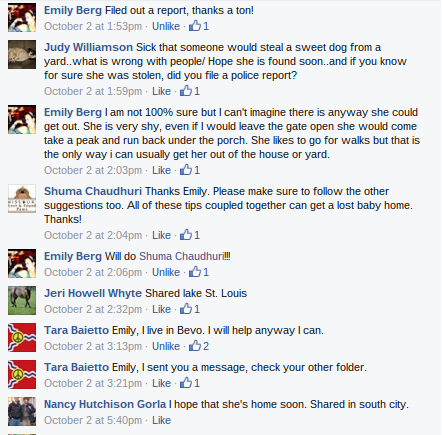 In the meanwhile, supporters of Missouri Lost & Found Paws shared links to dogs found in local area shelters. Emily followed up on each lead and was able to confirm that none of the dogs were her Sophie. Emily continued receiving leads on dogs at local area shelters resembling Sophie. Emily followed up on each lead and was able to confirm that none of the new dogs were her Sophie. 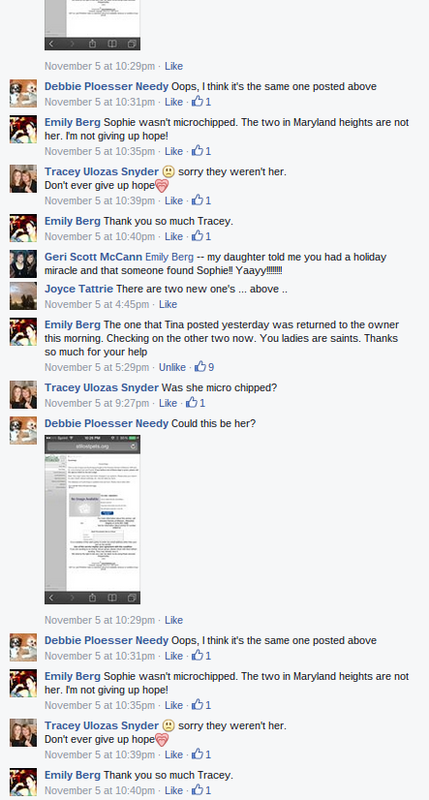 Just after the Thanksgiving holiday, a supporter posted that she had heard Emily had received a Thanksgiving miracle! The excitement began to rise! Emily shared her holiday miracle! 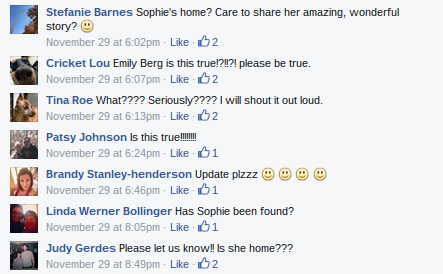 Sophie was indeed home! FIFTY-SEVEN days later, little 16 year old Sophie was back home in the loving arms of her momma! Welcome home, Sophie. Welcome home! Next Post The most valuable gift you can give this holiday season is a microchip.